A group of settlers from Barbados, led by John Vassall, settled in Cape Fear, Carolina in May of 1664. The "Barbadian Adventurers" had not, however, reached an agreement beforehand with the Lords Proprietors, who backed a group from New England settling in Charles Town. 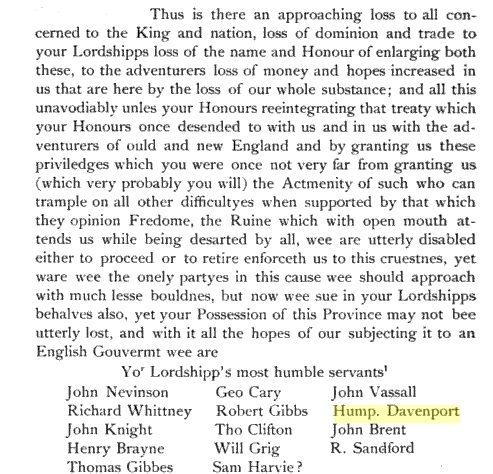 Petition to Lord Proprietors from settlers at Cape Fear. The first two ships carrying 19 families, sailed from New York to settle in Port Royal. They were later joined by others from New York, Holland, and England. The short-lived settlement at Port Royal (near present-day Beaufort, SC) under Sir John Yeamans; removed to Ashley River, site of present-day Charlestown.